PEPSI STOCK IS GOING TO POP! The soft-drinks and snacks giant provides Rob McIver of the Jensen Fund with the steady performance he craves. Only the most steadily profitable companies make it into the portfolio of the $3.6 billion Jensen Fund (JENSX). That approach has driven 5.3% annualized returns over the past five years, vs. 2.1% for the S&P 500. Jensen has held PepsiCo (PEP) stock since 2003, and last quarter co-manager Rob McIver upped that stake by 45%, to 2.5 million shares. He sees big gains ahead even amid an uncertain economy. "This is a hugely profitable, quality growth company," McIver says. "It is very predictable. From 2007 through our forecast 2010 results, the company's earnings have risen by 22%. There was hardly a dip in 2008 or 2009. We think that's a very, very powerful case for investment." People think of PepsiCo as distinctly American, says McIver, making it easy to forget that 50% of its revenue comes from overseas, including burgeoning markets such as Vietnam and Russia, where last year it acquired the leading juicemaker. "Pepsi has reached a plateau in the U.S. carbonated-drink market," he says, "but it's still making a lot of money here, and that helps fund new opportunities overseas." McIver says Pepsi will reign in emerging markets where consumers know its brands and are gaining income. "Today it accounts for about 40% of the global market in salty snacks, which is 10 times larger than the company's next-closest competitor," he notes, "and it can still grow." For a $60 billion company, PepsiCo is surprisingly nimble, says McIver. For example, its practice of distributing its snacks directly to stores, unlike competitors (who deliver to central warehouses), allows PepsiCo to react quickly to changes in consumer preferences and win market share. "It has huge competitive advantages, considering its scale, from negotiating price to relationships with vendors," says McIver. And after acquiring its two largest bottlers in 2008, which is expected to save the company $550 million a year by 2012, Pepsi, McIver thinks, will be even faster to introduce new products in its Naked Juice line, for instance, and coconut water business. Pepsi's shareholder-friendly attitude helps drive the stock's outperformance, argues McIver. From 2000 to the third quarter of 2010, he notes, the company returned more than $43 billion to shareholders via dividends and stock buybacks. For long-term investors like McIver, it means "our slice gets a bigger share of the pizza." McIver also thinks Pepsi's record of paying a dividend for the past 40 years is underappreciated. "The current dividend yield is very attractive at 3%," he says. And McIver values the experience of PepsiCo's management. "In this case, the top 11 executives have an average of 20 years each with the company," he says. McIver is expecting double-digit earnings growth and strong increases in free cash flow for PepsiCo in the next few years. Yet the stock still looks cheap. Over the past decade shares have traded at a 16% premium to the S&P 500 (SPX). Today that premium is just 7%. The stock ended 2007 at $77, McIver points out. "Now," he says, "it's $66, and the company is substantially more profitable today than it was then. It generates more earnings and free cash flow, and it has a broader product portfolio and global footprint," he says. And how about Coca-Cola (KO) stock? "Oh, we hold Coke too," he says, "but Pepsi's stock is more attractively priced at the moment." Although Subway eclipsed McDonald's number of restaurants in the U.S. over nine years ago, the sandwich chain has finally grabbed the global crown. 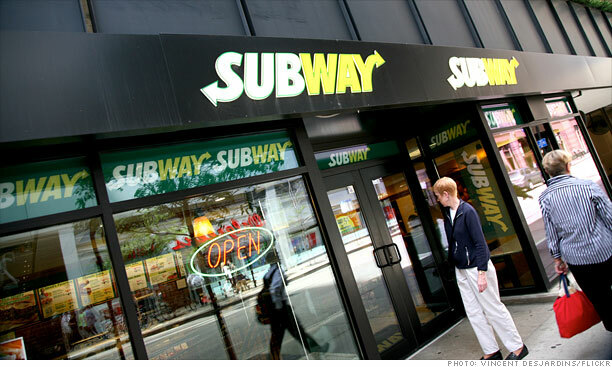 Subway had 33,749 restaurants worldwide at the end of 2010 and McDonald's had 32,737. What's the key ingredient to their sandwich success? It's all in their crazy locations. "Having stores in non-traditional locations certainly helps," said Les Winograd, a Subway spokesperson. "It allows us to get into areas that some of our big competitors would find difficult to do. Subway is flexible and we have minimal equipment, which allows us to be creative in where we go." 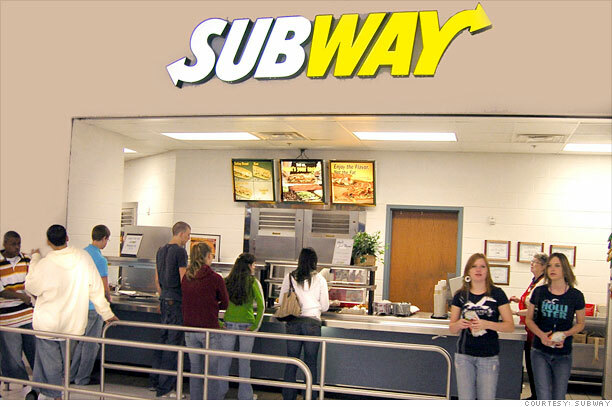 The Northwest Independent School District in Texas also operates a Subway franchise. Students at Detroit Central High School are not only able to enjoy some of Subway's five-dollar foot longs, they also get to earn some extra bucks and college credits while they're at it.The Subway University program began serving kids business classes last month in an effort to teach them valuable entrepreneurial skills using a hands-on approach. Students can enroll in the program and learn anything from how to prepare sandwiches to supply chain management. Detroit Central High School was the first in the country to implement the program, but a growing number of schools are opting to own and operate Subway sandwich franchises, right in their buildings. 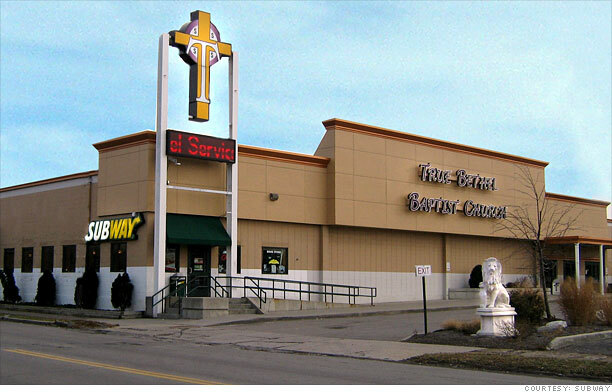 This Buffalo, New York church demonstrates that man shall not live by Hearty Italian bread alone. Reverend Darius Pridgen opened the restaurant at his church in 2003 to provide job training to neighborhood residents and food for the hungry.Having a Subway in the church was headline grabbing enough that True Bethel Baptist Church was featured last year on the CBS show, "Undercover Boss." Subway's chief development officer, Don Fertman, went undercover as a scruffy looking job applicant to rate how well the franchise was doing. 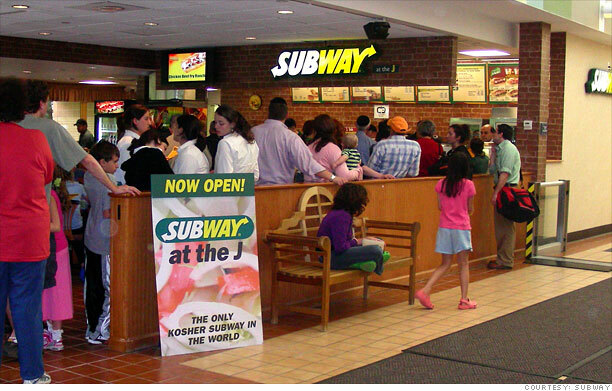 The first ever Kosher Subway in the world opened up inside the Mandel Jewish Community Center of Cleveland.The franchisee, Ghazi Fadoul, had already opened 100 Subway sandwich shops in the area but decided to replace cheese with a soy-based substitute and remove ham and bacon from Subway's menu for his new venture. The Cleveland Kosher organization supervises food preparation, except for Friday afternoons and all day Saturday, when the "Closed" sign comes up, in observance of the Sabbath. The German MS Stolzenfels is the world's first and so far only ship with a Subway restaurant. Passengers experience beautiful stretches of the Rhine River in Germany, with the option of eating a foot-long sandwich at the same time.This huge cruise ship operates on a daily basis between Rudesheim and Koblenz and has a capacity of over 100 potential Subway customers per journey. Towering high above the underground subways New Yorkers use to travel daily, the only way up for this Subway located above One World Trade, or Freedom Tower, is up.The skyscraper being built at Ground Zero will become the city's tallest, standing at 1,776 feet, sometime in 2013. 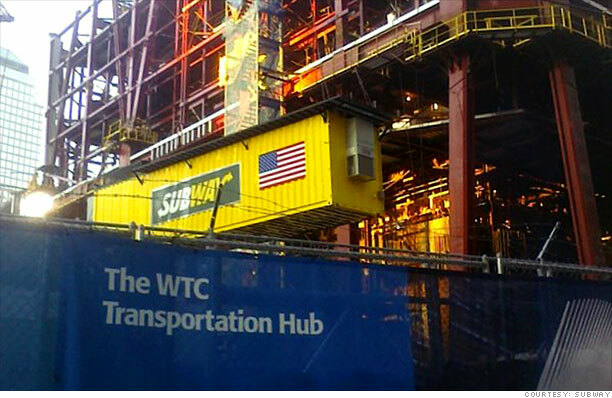 This Subway gets hoisted up to the next construction level as each floor of the tower is built, and will do so until the 105-story building is finished. For generations, apartment dwellers have wondered: Why am I sitting and staring at my clothes spinning in a washing machine when I could be eating a sandwich instead? 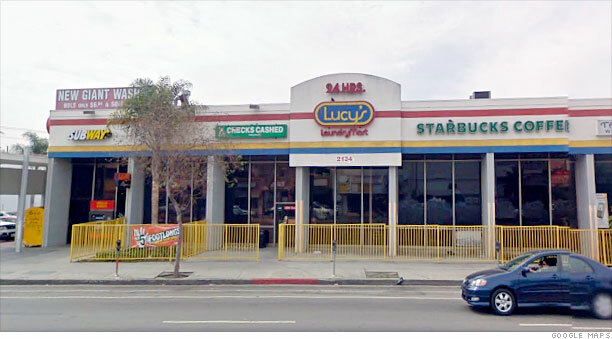 Subway has deigned to answer their cries for sustenance.Many of the large Lucy's Laundry Marts around the country, but especially in the LA area, sub-lease space to popular brands: Subway is one of them. The laundromat is open 24/7 but customers who want to eat from Subway's menu will need to do their wash between the hours 7am -- 11:00pm, when the restaurant is open. Google has an enterprise division? Yes, and here's how they're using every asset the company has, from Apps to Android, to beat the big players. Dave Girouard first joined Google seven years ago, back when the search company wasn't even on the radar of corporate customers. 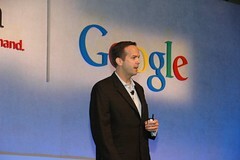 Girouard now serves as president of Google's (GOOG) enterprise division, a fast-growing (though still tiny) part of the company's business. Over three million corporate customers subscribe to Google Apps, a suite of web services that includes customized email addresses, shared documents and calendars. And Google is determined to make its successful Android mobile operating system a viable competitor to RIM's (RIMM) BlackBerries and Apple's (AAPL) iPhones in the workplace. I recently caught up with Girouard to find out how his division is tackling reliability and security issues (not to mention competition from Microsoft (MSFT), Android's prospects as a business-ready device and what the upcoming management changes at Google could mean for the company's enterprise business. Fortune: What's Google doing to address concerns about storing data in the cloud? Girouard: Our belief is that your data is safer inside Google than it is inside your own computers. But we are doing all sorts of things to make sure our user data is protected. A simple example is we now have for every Google Apps user what's called two-factor authentication. That means in case someone gets your password you can actually block that by requiring a special code you get off your mobile device to access your account. On the reliability side it's a similar story. There's no system that's prefect and no company that's perfect and we certainly aren't. In 2010 Gmail had 99.984% uptime. What that means is statistically the average user had 7 minutes of downtime per month in Gmail. Some were worse than that; the vast majority never saw any but that's the average. That is an order of magnitude better than what on-premise traditional systems can do. Now, are we perfect? No. Will you ever have glitches? Yes. Google obviously competes with Microsoft on many different aspects. On the enterprise level how do you go about competing with Microsoft's sales teams? Well, Microsoft is a great company and they react very well to competitors so they're never somebody we take lightly and they certainly have more people and presence in the market than we do. Having said that we think we have some very unique capabilities and the nature of the technology change suggests there's an opportunity for somebody new to drive this market. We do think in the realm of cloud computing we have a lot of advantages. On the sales side and the marketing side and operational side we have been building a team of folks that come fromt the industry – places like Oracle (ORCL) or IBM (IBM) or Microsoft – that are really steeped in enterprise experience but also fit with the DNA of Google. We've been building that team now for seven years. We also are really focused on building an ecosystem of partners. We'll have a reach that I think can be comparable to Microsoft. It will take us time. And we want to do it in a different way. What do you see as the advantages of Google's cloud-based services versus Microsoft's? We have the advantage of being born of the cloud. We are a 100% web company. We're not trying to retrofit anything of the past. Microsoft is a great company but their applications were built in the world of a single PC and a single user. What that amounts to is we can go faster. We are pure web. We only have one email system. We only have one code base and it allows us to be more nimble. We are putting features out to our customers that were only conceived of a few months ago or maybe even a few weeks ago. So we don't have a to wait for the next big bang upgrade. There's no such thing as a big bang upgrade in our world. The applications just continue to get better every week. That model of delivery is really hard for Microsoft and others to replicate. Android's been growing like crazy on the consumer side but on the business side there doesn't seem to be a lot of uptake yet. What are you doing to make that happen? Actually there's been a lot of uptake. We hear it mostly through the companies we talk to about Google Apps. We've done a lot of work to make it [Android] the best experience for our apps and also make it work in a secure manner. We've made great progress. We already are in a situation where you can bring your Android phone to work and they can force you to have a certain policy, use a certain type of password and wipe the device in case it was lost or stolen. Android adoption is actually quite rapid in businesses and as we continue to mature the feature set with respect to device management from a business perspective it will only accelerate. Do you expect there to be any changes in the enterprise business now that Google is undergoing management shifts with Larry Page coming on board as CEO? Larry has always been a great supporter and advocate of our business. I interviewed with Larry when I joined a long time ago and I remember having a great conversation about enterprise computing so I have nothing but excitement for what Larry's going to do for the company. [Outgoing CEO Eric Schmidt]'s always been a great supporter as well. So I don't see a shift in that way. Larry is probably going to be a big advocate to giving more autonomy to businesses within Google and I think that will be a good thing. As we prove ourselves and grow we'll probably accelerate in terms of the resources we get and the hiring we do. That's one of the things I look forward to. Second-day iPad 2 stories were dominated by reports of long lines and product shortages, some of them clearly colored by the reporter's personal disappointment. Mark Gurman's piece about "poor retail launch planning" posted at 9to5 Mac, for example, might not have been as critical of Apple (AAPL) if, after waiting 10 hours in line at the company's Century City store, he hadn't watched a buyer in front of him let friends jump the queue and clean out the last of the model Gurman had set his heart on. New York City's Fifth Avenue retail outlet -- which prides itself as the world's best-supplied Apple Store -- ran out of all but the 64 GB Verizon 3G at 11:00 p.m. Friday, 6 hours after it began admitting a crowd that Apple estimated (unofficially) at between 1,200 and 2,000. "You should have seen it," one staffer said the next day. "The minute we announced that we only had Verizon iPads left, half the line disappeared." One reason for the lack of interest in the Verizon (VZ) model, this staffer speculated, was the high percentage of first-day buyers who were there to supply gray-market iPads for re-sale overseas. Because iPads built for AT&T (T) use the GSM protocol -- the prevailing global standard for cell phones -- and are sold "unlocked," they can work in most foreign countries simply by replacing the SIM card. By Saturday morning, there were no lines in front of the big glass cube on Fifth Ave., although there was a steady stream of foreign-language speaking customers who, judging from the haste with which they dashed to the door, hadn't gotten word that all the GSM iPad 2s had been sold. Rumors that fresh supplies were on the way could not be confirmed. For customers willing to order from Apple's online store, shipping times are currently listed as 2-3 weeks for some models and 3-4 weeks for others. If you go by the strict definition of the word, yesterday marked the second anniversary of a bull market. You could have fooled me. The total return is even higher. So why don't we feel better? If you want to find a pessimist's pessimist, look no further than the Tea Party. According to a recent poll, only 3% of Tea Partiers think a recovery has taken hold in the U.S. The rest, of course, think we're all going to economic hell in a socialist hand basket. --The stock market is up 95.6% from its March 9, 2009 low. --We have seen six quarters of economic growth in this country. --Job growth, while tepid, is also improving. Last month the US netted 192,000 new jobs. --Corporate America reported record profits of $1.66 trillion in 2010. --The economy has been supported by unprecedented amounts of economic stimulus and aneasy money policy -- so-called QE2 -- from the Fed. A weakened dollar hasn't hurt either. While I'm not sure my mind has grasped all the relevant issues, I'm generally in support of stimulus at crucial junctures. But an optimal bull market is one that is not supported by a tidal wave of government cash. --That 95.6% gain is off a low brought about by sheer investor terror. A gain is a gain, of course, and this is no dead cat bounce, but it seems germane to any discussion of the health of the stock market to remember that we'd all but left it for dead two years ago. Sure, it's alive and out of the wheelchair, but it's hardly back in marathon shape. --A Bloomberg National poll released yesterday showed than only 1 in 7 Americans has faith that a lasting economic recovery has taken hold. A plurality says they're worse off than they were two years ago. --Oil prices are currently sitting at over $100 a barrel due all the chaos in the Middle East. Somecommentators have argued that we're getting too excited about the possible negative economic effects of the price spike. So discuss it calmly if you'd like. It's still much worse for our economic prospects than would be $40 per barrel prices. --Wal-Mart (WMT) announced this week that it would begin an aggressive rollout of smaller stores next week. If that's not a sign of the economic apocalypse, I don't know what is. Don't get me wrong. I believe both Warren Buffett and Jamie Dimon when they talk about the crucial assets we have in this country -- our dynamism and entrepreneurialism. But that doesn't mean our overleveraged way of living is just something we can consign to history without paying a far higher price than we have to date. I spent the years between 1979 and 1984 living in Riyadh, Saudi Arabia. My father was an obstetrician, and he worked at the King Faisal Specialist Hospital, delivering the children of princesses. (Literally.) Like all doctors, he wasn't much of an investor, and he got sucked into buying gold when it was around $800 an ounce. He got crushed, but luckily for us, he was making tax-free income, we were living in free housing, and the price of gas was so low that it almost felt like they were paying you to fill up your car. When he passed away a few years back, he had righted his retirement accounts enough by that time that my mother is pretty well off. To tell you the truth, though, I always felt he'd been played for a sucker when he invested in gold.Gold? Come on, Dad. Well, here we are in 2011, and I own more gold in my retirement accounts than I ever thought I would. Call it a bull market if you want. I'm still pretty much on the sidelines. * If only Dad had hung on, he'd have made a killing. *I was criticized at length for suggesting in a recent column that hedge funds had run out of good ideas and were all just piling into Apple (AAPL). If I was so smart, I was asked, why was I not retiring with a portfolio full of Apple shares? Touché, commenters. I have no criticism of a hedge fund manager who bought Apple stock and rode it all the way up to its current levels. I just wish we didn't have to pay them 2-and-20 for the idea. But that's just one man's opinion. NEXT iPAD CHALLENGE COMING FROM AMAZON? (gigaom.com) -- Just as the first early iPad 2 reviews are landing, there’s talk of a new Apple tablet competitor in the form of Amazon. Why? Because although there are solid hardware contenders available and coming soon from the likes of Motorola (MMI), Samsung and others, all are following flawed strategies, according to research firm Forrester. These devices are comparatively priced too high — a point we explained with the Xoom — and all are reliant on external companies for the retail experience. So how and why could Amazon succeed where others are considered to be failing? Motivation. Apple’s (AAPL) recent in-app subscription rules requiring 30 percent of content revenues — including Kindle (AMZN) books — could feed the fire for Amazon to take on Apple. Think of it as a hedge against relying upon the iPad for some Kindle content sales. Price flexibility. 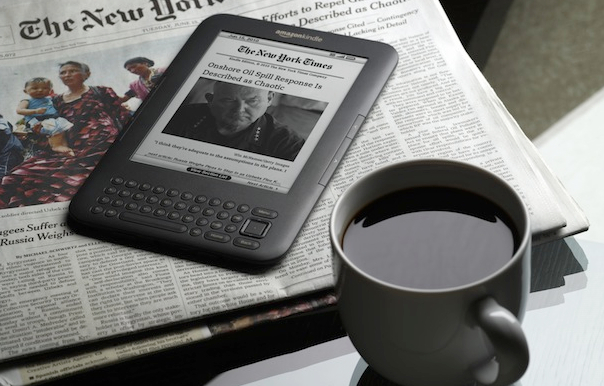 Epps suggests Amazon could design, build and then sell a tablet for less than costs. A similar sales model is rumored to be in the works for Amazon’s Kindle device: the e-book reader could be given away to all Amazon Prime customers. Branding and channel. Amazon is already known as a leader in the online retail business. The same can’t be said of any tablet makers, save Apple. Strong sales of the Kindle show that Amazon can create a consumer electronics device, sell it to the masses — both directly online and in retail parter stores — and then reap benefits by providing content for the device. Epps makes a solid case for Amazon as a potential player in the tablet market. And earlier this year, Amazon announced details for its own app store that will support Android mobile applications, so there’s little doubt that Amazon is looking to get in on the tablet action. But solid reasons to enter the market and an app store won’t guarantee success. If Amazon does built a tablet device, it’s going to face the same operating system challenges found by all who are using Google’s Android Honeycomb platform. At the moment, Honeycomb feels a little rushed to market with stability issues, missing hardware support and a lack of tablet-optimized applications. That’s taking what could be a stellar experience on Motorola’s Xoom and turning it into one that cries “not ready for prime time.” These issues should diminish over time, but it gives Apple and even bigger head start in this market. Then there’s the sales challenge involved. It’s one thing to rely primarily on the web to market and show off an e-book device, but tablets are far more complex. Put another way: It’s not difficult to understand what the Kindle does by hitting the Kindle website, because it primarily does one thing. Tablets are complex full-computing devices which will make it more of a challenge to re-use the Kindle marketing strategy. Simply put: tablets are different devices depending which apps are currently in use. With such challenges, why should Amazon even attempt to crack the tablet market? The answer can be gleaned from the e-book market, where according to IDC, Amazon ended 2010 with a 48 percent market share. It’s the classic razor and razor-blade model that has propelled Gillette (PG) to success: Get the product in consumers hands at a low cost, then reap rewards on refills. In the case of Kindle, those refills are e-books, while for tablets, the ongoing purchases are in the form of apps. IDC estimates e-book device shipments more than doubled from the third to fourth quarter of 2010 with 12.8 million sales in the final quarter compared to 6 million from the prior period. That’s a solid growth rate, and it allows Amazon millions of content purchase opportunities where it makes a cut of e-book sales. But those numbers pale in comparison to the hot tablet market. IDC figures 50 million tablets will move in 2011, up from 18 million in 2010. And none of those tablets currently benefit Amazon’s revenue stream, save for the Kindle book purchases, which can already be made from a number of other devices. But with a tablet of its own, Amazon has the potential to earn a 30 percent cut of every single application purchase made through its store instead of ceding those revenues to the likes of Apple, Motorola, Samsung and others. And if smartly leveraged, Amazon could advance media distribution for music and video; two digital services the company provides today. That may be motivation enough for Amazon to succeed in a segment where others are still struggling. The practice of co-location, whereby firms deploying extremely high-speed trading strategies locate their server next to that of the exchange or trading venue, is nothing new. But according to research published last month, high frequency trading firms looking to shave every last micro-second off their trading speed ought to co-locate their servers in the wastes of the Antarctic or the middle of the Atlantic ocean. The research paper Relativistic Statistical Arbitrage, which was published in science journal the Physical Review in November, explores how high-frequency trading firms -- which deploy trading strategies that are dependent on routing trading information around the world and across multiple exchanges and trading venues at sub-micro second speeds -- can optimise their trading infrastructure and trade even faster. In the paper, the authors provide a general formula firms can use to calculate the optimum global location for servers hosting high-frequency trading type programs to sit in between multiple exchanges - they are identified by the small, blue circles on the graph, while the world's biggest exchanges are identified by the large, red circles. The authors Alex Wissner-Gross and Cameron Freer, both research affiliates at the Massachusetts Institute of Technology, used the formula to triangulate the best possible locations in the world for locating servers across some 52 exchanges globally. According to the results, high frequency trading firms should think about locating their servers not only in Europe's popular hotspots, such as Basildon and Brick Lane, but in the North Pole, the Atlantic and Pacific Oceans, and the middle of the Australian desert, among others (see map). The research could give rise to new data centre hot spots, say the authors. If this sounds broadly preposterous, think again: in 2008, Google filed a patent for a floating offshore data centre, while 2007 technology firm Sun Microsystems unveiled plans to build a data centre in an abandoned coal mine. The topic and the paper are the subject of discussion at the New York High Frequency Trading World conference being held this week.